2018 WSOP Event 71: Phil Hellmuth Wins 15th Career Bracelet in $5,000 No-Limit Hold'em! "It means everything to me, because my life is poker, number one." 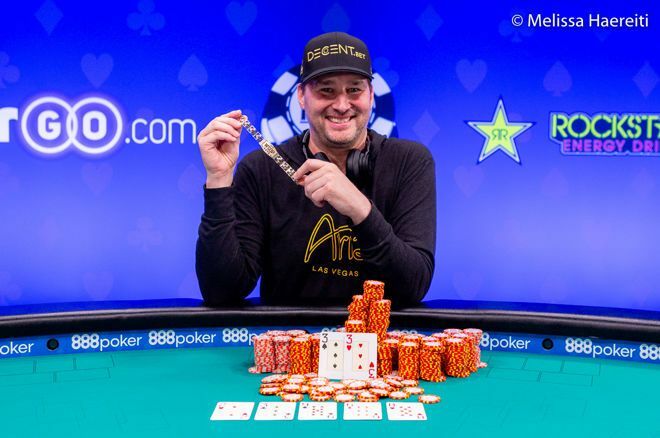 Phil Hellmuth takes home his 15th bracelet! Phil Hellmuth asked his wife, holding the coveted prize in his hand. But it was real, and a jam-packed crowd in the Brasilia Room witnessed the Poker Brat winning his fifteenth career bracelet in Event #71: $5,000 No-Limit Hold'em (30-minute levels) for $485,082. Hellmuth defeated Steven Wolansky heads-up after holding the short stack for the vast majority of their battle. It's Hellmuth's first bracelet since winning the $1,500 Razz in 2015 and his ninth bracelet overall in a No-Limit Hold'em event. "I'm humbled. It's humbling," was the first thing Hellmuth said after being asked what the record fifteenth bracelet meant to him. "Thirteen in Europe was really humbling for me. And so is fourteen, and so is fifteen." To say it hasn't been the best of summers for the record bracelet holder would be quite the understatement. 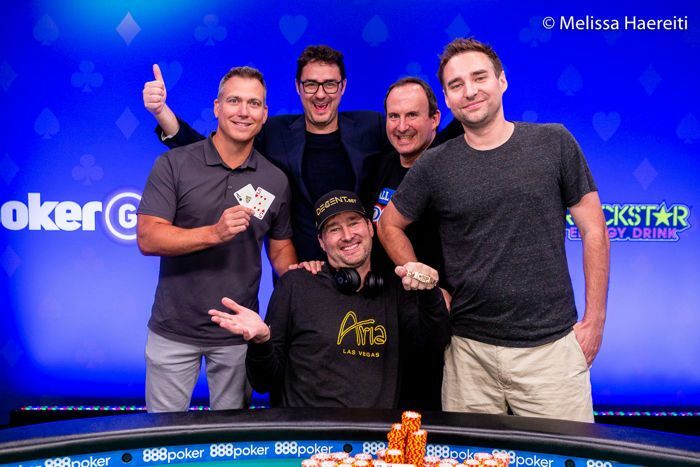 While Hellmuth was taking more time off due to a little atrial fibrillation, he's has made just five minor cashes since the start of the WSOP, with his best result advancing one round in the $3,000 No-Limit Hold'em Shootout for a mincash of a little over 6K. On top of that, the Poker Brat drew the wrath of the poker community after swearing and speaking out of turn during the Main Event. "It's the swingiest week in my life; from people cheering because I busted to — I think — a lot of people cheering that I won." "Listen, I was completely out of line." Hellmuth said apologetically. "James Campbell, he and I have been texting back and forth. We go along great. I bought him into the Main Event." "When I went to bed that night, I looked at social media and realized I may have affected his tournament. I was going to bed but instead, I went to the couch and spend two hours on social media. I couldn't sleep, I felt so bad. I didn't know how to handle it. The fact is: when I busted out from the Main Event and the poker room was cheering, I was crushed. I was like 'oh my god, what did I do? Everyone is against me. It felt like such a low point for me in my career." "Then I said: the only thing I can do is buy him into the Main Event and that's gonna make me feel better. So I bought him in and I went from 400 negative tweets to 600 positive tweets in one day. It's the swingiest week in my life; from people cheering because I busted to — I think — a lot of people cheering that I won." Hellmuth returned along with another 38 players out of 452 for the second day of this event, and with 30-minute levels chips were flying everywhere right from the start. The likes of Anthony Zinno (37th - $9,747), Davidi Kitai ($11,176), Liv Boeree (31st - $11,176) and Antoine Saout (30st - $11,176) all falling in the early stages. Boeree's bustout was especially brutal: after flopping a set of fours, she check-raised a bet from Hellmuth and received a call. On an eight turn, Boeree check-called all in and was aghast when Hellmuth tabled pocket eights for a higher set. It proved to be a pivotal pot for Hellmuth on his way to number 15. Start of the day chipleader Jonathan Abdellatif finished in 20th place after losing two big all-ins in a row. 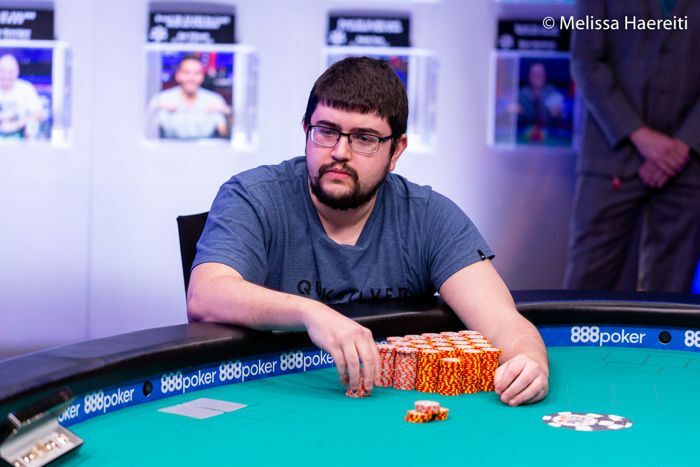 He wasn't the only notable that fell short of the final table, as Chance Kornuth (18th - $15,726), Grayson Ramage (17th - $15,726), Griffin Benger (15th - $19,280) and Jeremy Ausmus (12th - $24,147) all bowed out shortly before the big prizes were being awarded. The unofficial final table with ten players dropped to eight in a single hand as Aliaksei Boika eliminated both Paul Fontan and Eric Hicks in one hand. 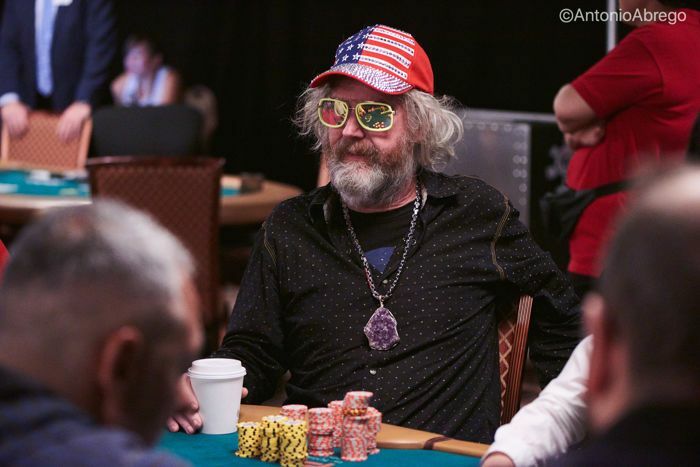 The lively Hicks, a standout with his jovial antics among the more serious opposition, ran his queens into the kings of Boika and saw his WSOP dream come to a screeching halt. "All this way just for that," Hicks moped as he went off to collect his 9th place reward ($30,881). Despite the turbo nature of the structure, the eight players played 25 hands together before Ralph Wong (8th - $40,309) became the first casualty. Wong was shortly followed by Paul Hoefer (7th - $53,682), who lost a big coinflip against Matt Glantz shortly before losing his final chips to Alan Sternberg. Although he doubled through Hoefer, Glantz (6th - $72,911) would be next to go when his flush draw didn't come in against Boika. Ken Fishman lost a crucial all in with ace-ten against the ace-eight of Wolansky when the latter spiked an eight to leave Fishman short. He shortly busted after in 5th place for $100,956. "I said let's not give up; these things can turn." Boika, who held the chip lead through the vast majority of the final table, suddenly found himself on the rail after losing two big all-ins. With ace-king, Boika didn't get there against Wolansky's kings to finish in 4th ($142,458). Sternberg, one of the highlights of the final table, finished in third place. Hellmuth found the ace he needed with ace-five against Sternberg's pocket kings, and the American went to the rail 16 hands after when he ran his jack-nine suited into Wolansky's ace-queen. Wolansky would start the heads-up with a 3:1 chip lead against Hellmuth, but the Poker Brat quickly got the stacks back to even. However, it would be short-lived as Wolansky started chipping up with mostly smaller-sized pots. Hellmuth had the following to say about their heads-up battle. "He wouldn't give an inch, I know he wouldn't give an inch. I had to start thinking about how I wanted to handle this. I thought, I have to try and steal more pots against him to give myself a chance because he's just not giving a chip away. He's making it really tough. and I have to just keep playing my best poker until the end and maybe something great will happen." "I was down after I made a call, where I felt a little bit silly afterwards. I said let's not give up; these things can turn. When is the next time you're going to have an opportunity where you're heads-up for a bracelet? You just need to hang in there and stay strong and I stayed strong. And then, luckily, I hit some cards." Crucial for Hellmuth was an all-in situation with king-ten of diamonds against Wolansky's king-jack of hearts. Hellmuth flopped a flush draw, but it would be the tenball on the river that kept his bracelet dreams alive. Holding the chip lead for the first time in their heads-up battle afterwards, Hellmuth found himself all in with pocket threes against Wolansky's ace-nine. A trey on the flop all but sealed it and by the turn, the room erupted as the world is now a 15-time WSOP bracelet winner richer. Hellmuth dedicated his fifteenth bracelet to Bill Lee, angel investor, Elon Musk's best friend and one of his own good friends. “I promised him I would win him a bracelet. But I promised it a long time ago. I told him he has to fly here to collect the thing! I said, "Bill is an amazing guy and I promised him I'd win him a bracelet, but I promised it a long time ago. I want you to be here when I win it! He's not here," he chuckled. However, when asked about what his bracelet meant from a legacy perspective, Hellmuth took on a more serious tone. "It means everything to me, because my life is poker, number one. Number two, I'm trying to spread positivity to the world. I want to be remembered in two ways: one, having 24 bracelets and number two, starting the positivity movement and having a lot of influence on people lives. Every day, people tweet I read your book, it changed my life. That's what I want; the spotlight that I have becomes a responsibility. Once I realized I could inspire people — yes, I'm still the poker brat — I took that seriously."